In this tutorial, I want to briefly describe Typescript and Webpack technologies and how to get started using both of them together. So let's get started! Let's go ahead and open a terminal window, create a new project directory, and cd into it. Next, let's create the following directory structure inside of the project. At the root of your project directory, run "npm init -y" which is a NPM command that creates a boilerplate package.json file for you. Next, we'll install Typescript and Webpack. 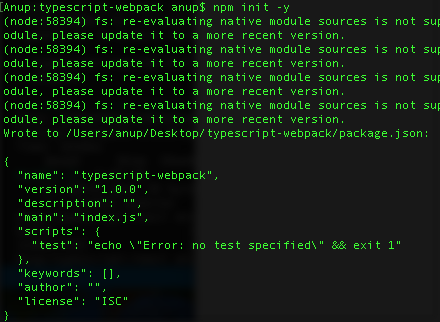 Notice that I installed Typescript and Webpack beta version with the " — save-dev" flag, which simply means that I want to save these packages as developer dependencies (i.e. these are packages that the actual web application doesn’t need but are used by developers to produce the final web application). Here’s how my package.json file and root directory look right now. Next, let's install ts-loader by executing npm install ts-loader (remember to save it as a developer dependency). Now that we’re trying to use Typescript, we should create a Typescript configuration file in the root directory — be sure to name it tsconfig.json. We'll also want to modify our package.json to include a NPM script which runs Webpack for us. Added a "build" script to the package.json file. Here's how my package.json file and project directory look right now. We're finally here — the moment of truth! If we run "npm run build" in our root directory, we should see Webpack do its magic and produce a bundle.js file in the build directory. If we open the index.html file and look at the console, we should see our greeting "Hello World!" as below. In next tutorial, We integrate ReactJS to the typescript and webpack. Click Integrating ReactJS, Typescript, and Webpack Part 2. to continue reading.